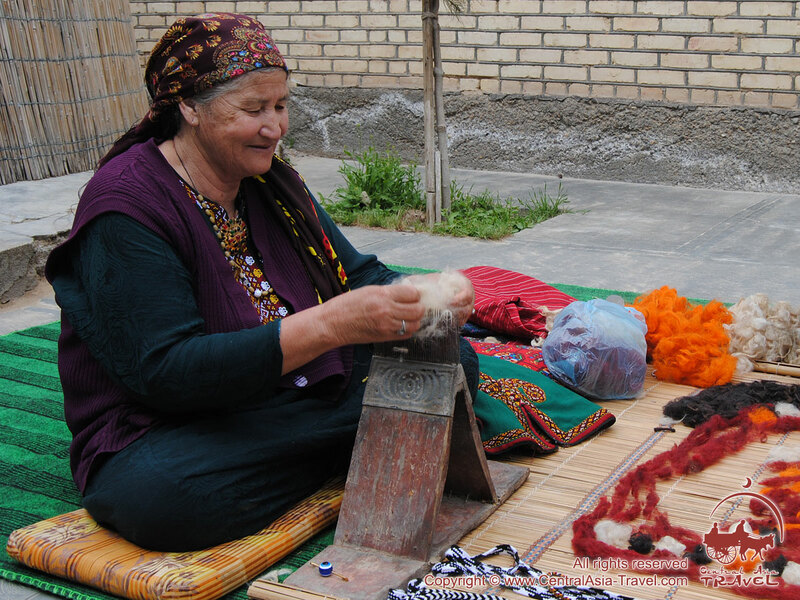 Turkmen carpets and Akhal-Teke horses, Sunday bazaars and innumerable historical monuments, such as ruins of the ancient fortresses of the Achaemenid dynasty and archaeological sites of the Parthian period, the ancient cities of Merv (Turkmen Merw, Persian Marw), Koneurgench and Nisa, medieval castles, forts, caravanserais, mosques, mausoleums and tombs - all this attracts numerous tourists to hot Turkmenistan. Among the contemporary places of interest that any tourist must visit are the gigantic Turkmenbashi Ruhy mosque, the Turkmenbashi and Ruhyyet palaces, the Independence Monument, the Arch of Neutrality and, certainly, the Turkmen Carpet Museum, where among numerous ancient artefacts you cal see a colossal modern carpet 301 sq m in area, called ‘The Golden Age of Saparmurat Turkmenbashi’. 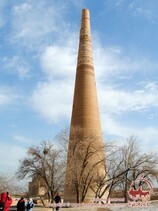 Apart from interesting historical and modern monuments, Turkmenistan boasts a number of natural attractions, such as the large Karakum desert with its dunes, the Bakharden cave with Kou Ata Underground Lake in it, the famous Door to Hell - a burning crater near the village of Derweze (Darvaze), the Plateau of the Dinosaurs (Khojalil), the Yangikala Canyons, the Repetek National Park, the Kugitang Nature Reserve, the Kopet Dag Preserve and other interesting objects. Despite its strict visa system, Turkmenistan today is one of the most attractive countries of Central Asia for tourists. 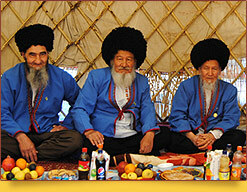 Turkmenistan amazes and enraptures, cooks delicious food and celebrates holidays in a most spectacular way. 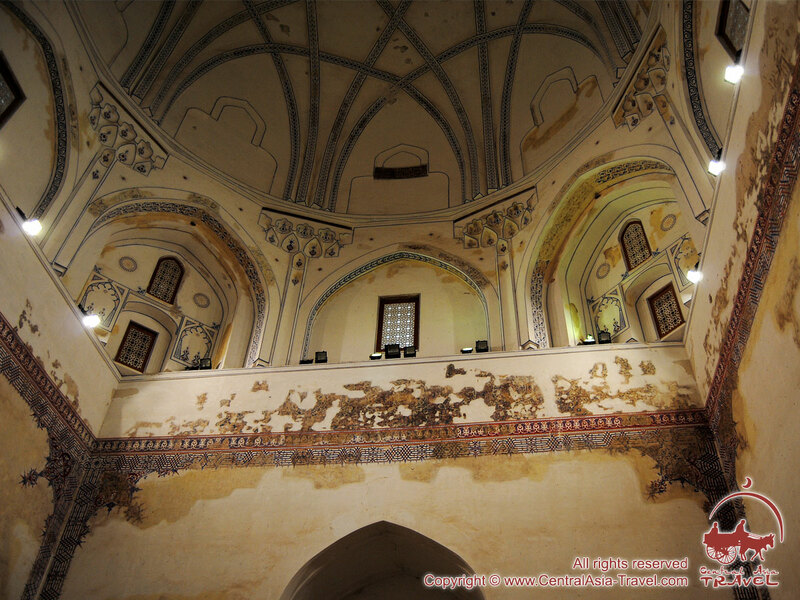 For many years this country continues to fascinate those who love the Asian culture. Location. 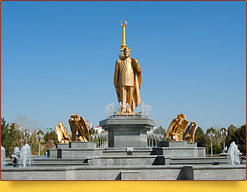 Turkmenistan, the territory of which in the course of history was occupied by almost all major rulers of the East, is now an independent state. 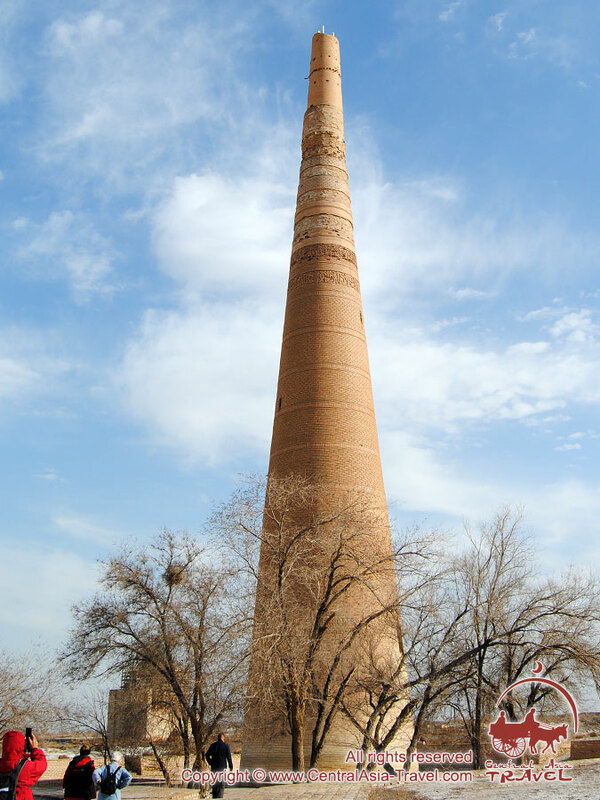 Situated in Central Asia, it borders on Uzbekistan, Kazakhstan, Afghanistan and Iran. The country’s inhabitants are happy enough to listen to the sound of surf at the Caspian Sea, which is in fact a gigantic saltwater lake having no connection with the ocean. Area. 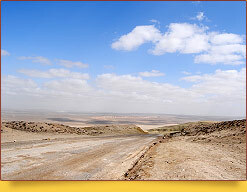 The country is situated on an area of 491,200 sq km. 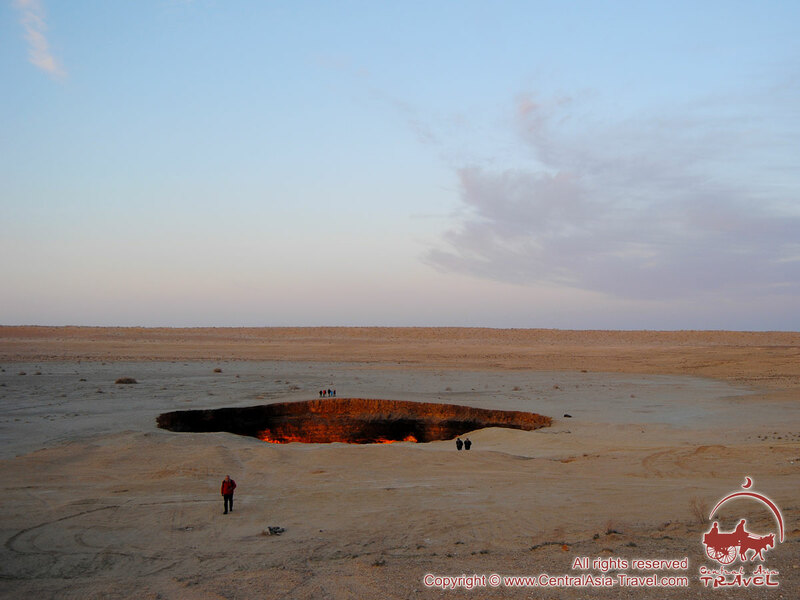 About 80 % of Turkmenistan’s lands are occupied by deserts. Although barely suitable for agriculture, they contain resources of natural gas large enough to place the country among the world’s leaders in this sphere. 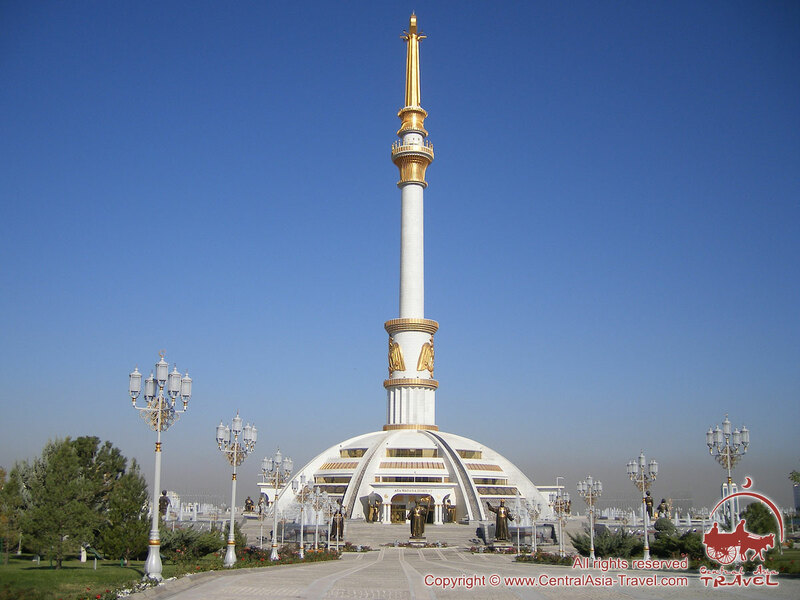 The population of Turkmenistan is 5,169,660 people. Ethnic composition. 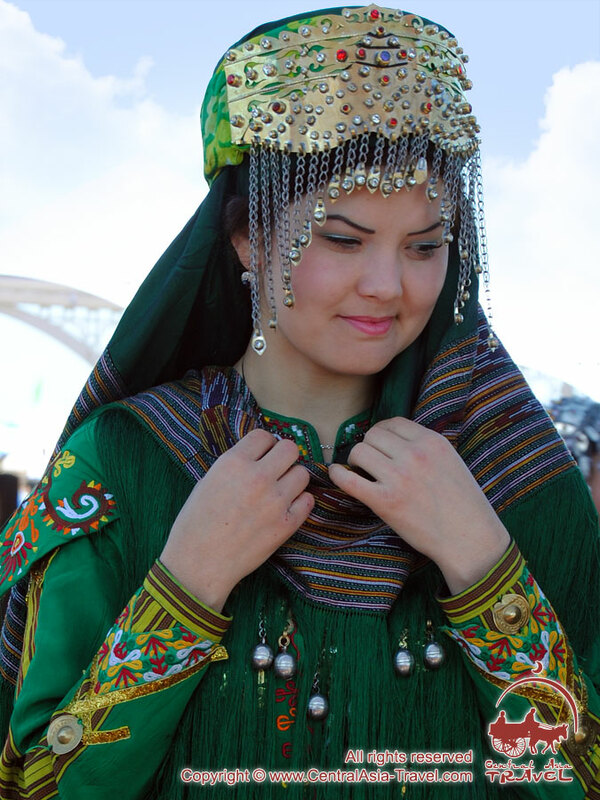 Turkmen are the indigenous people of Turkmenistan and make up 91 % of the country’s population, with Uzbeks comprising 3 % of the people and Russians - 2 %. 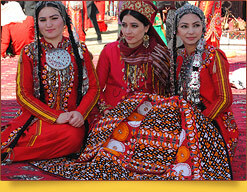 Kazakhs inhabit mostly the northern part of Turkmenistan and the area along the Caspian Sea shore. Political structure. The country is governed by the president. In the previous decade the political system of the state changed greatly. Until 2006 Saparmurat Niyazov was the permanent president of Turkmenistan, while today’s leader must be elected for a five-year term. Mejlis, the local parliament, performs the legislative functions. Recently political parties have started to appear in the country. Administrative and territorial division. Turkmenistan is divided into 5 provinces (velayat), with one city, the capital, having the rights of a province. 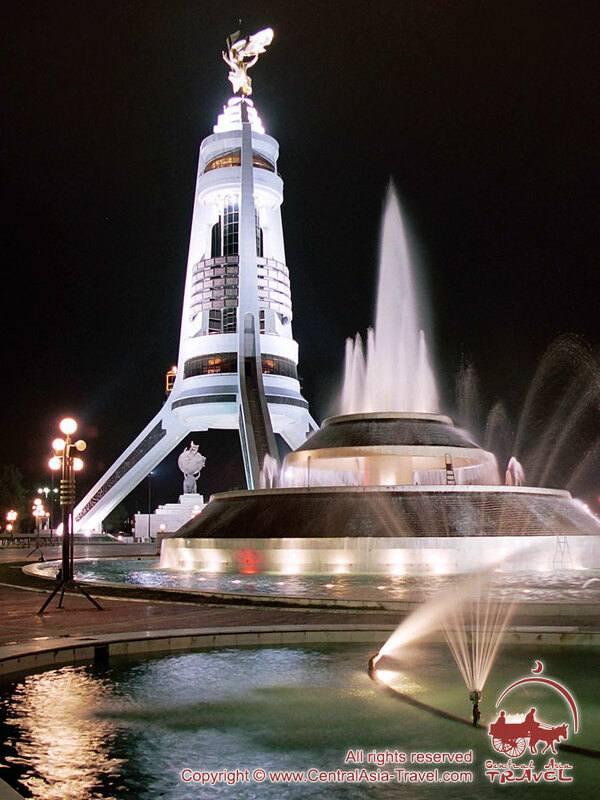 The capital of the country is Ashgabat with a population of 900,000 people. The city was included in the Guinness Book of Records for the number of buildings of white marble, which, together with an interesting blend of elements of eastern and European architecture, make the capital one of the most beautiful cities in Central Asia. Monetary unit - manat. 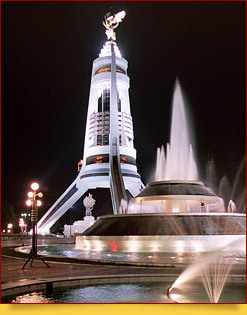 Use of any other currency for making payments is officially prohibited in the territory of Turkmenistan. Religions. 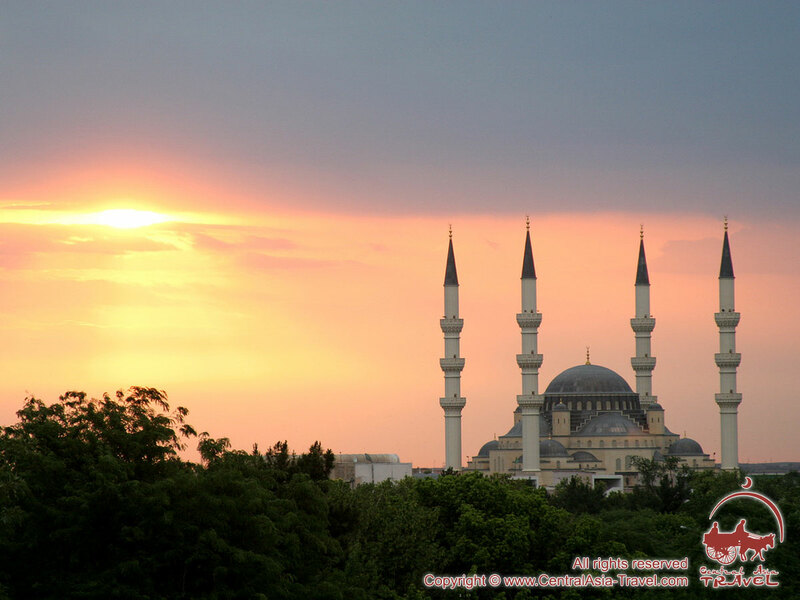 The overwhelming majority of the population, 89 %, professes the Sunni branch of Islam, with 9 % of the people being the followers of the Christian religion. Only 2 % are representatives of other religious groups. 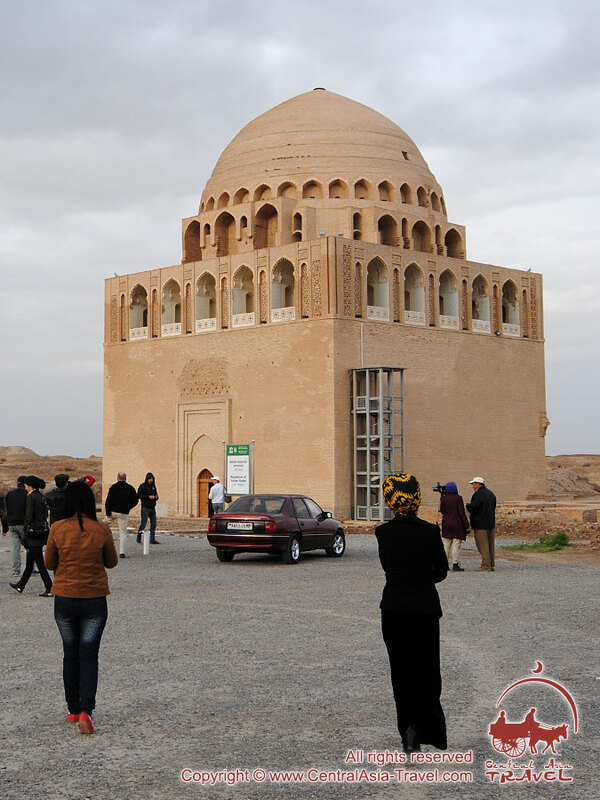 Turkmenistan has several Islamic holy places, such as cemeteries and medieval tombs, which often attract a number of pilgrims. Time zones. 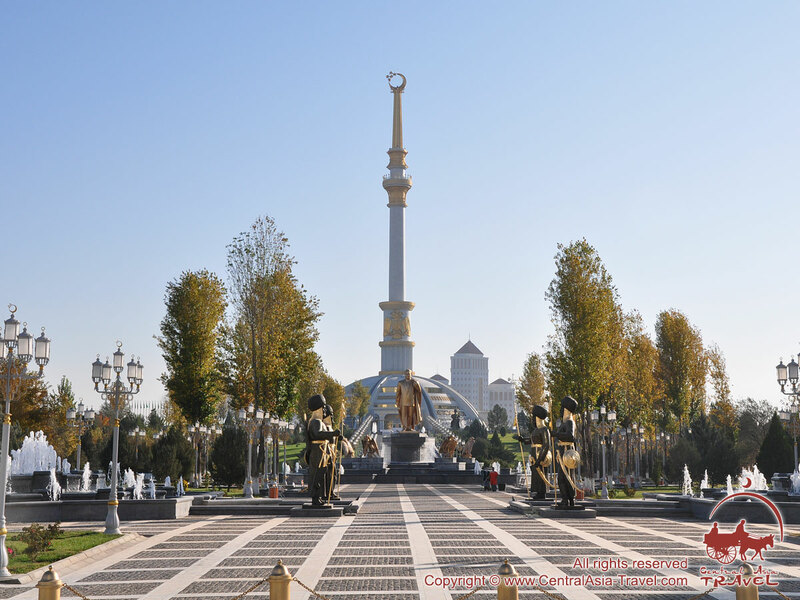 The whole territory of Turkmenistan lies in one time zone, and the clocks do not switch to summer time. The local time differs unchangeably from the Greenwich Time by +5 hours. Electric power. 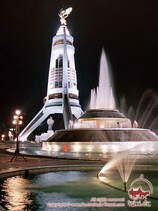 Standards B and F sockets with a voltage of 220 V and a frequency of 50 Hz are used throughout Turkmenistan. 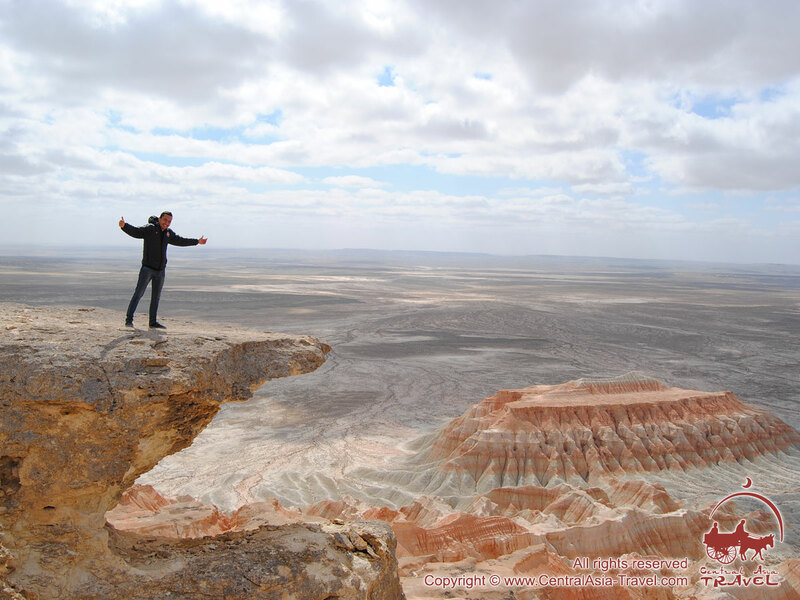 The climate in Turkmenistan is continental, dry, with great temperature fluctuations, low precipitation and high evaporation. The summer is usually hot and dry, with an average temperature of 28-32°C in July. The winter is mild and with little snow; however, some years feature short but strong snowfalls, and at times the temperature may drop to -20°C. The average temperature of January ranges from -5°С in the northeast of the country to +4°C in the south. 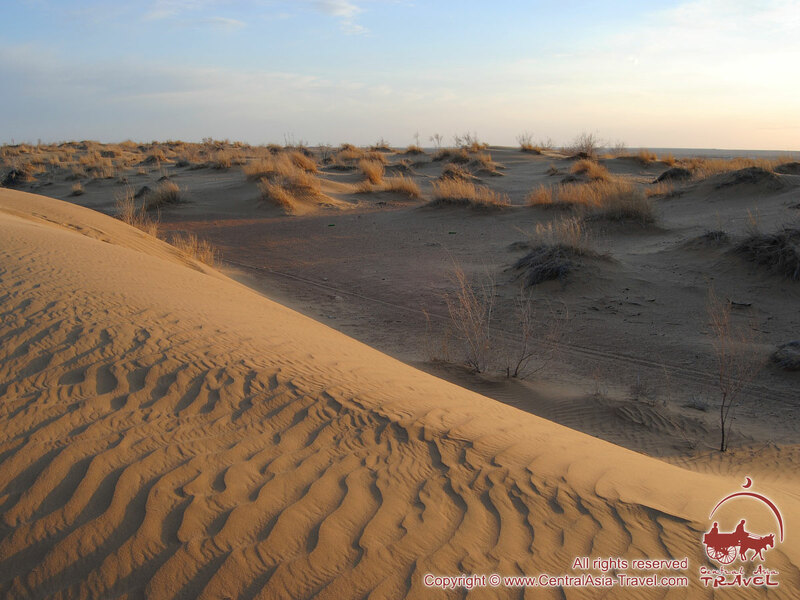 Continuous winds bringing cold masses of air from the steppe regions of Kazakhstan in winter time and hot masses from the mountain slopes causing sandstorms in summer time are the most characteristic feature of the Turkmen climate. 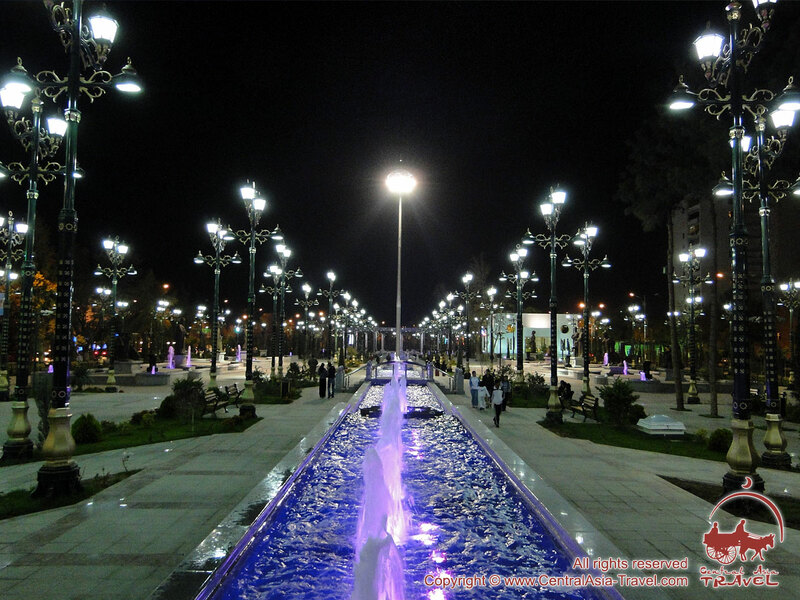 The best time to visit Turkmenistan is spring (from March to May) and autumn (from September to November). How to Dress in Turkmenistan. As in most of the Central Asian countries that were once a part of the Soviet Union, there are no official restrictions as to the colour and type of clothes you wear. In the street you can see a lot of people dressed in national clothes; however, the locals do not object to the wearing of European trousers, dresses and other garments. The only thing you should avoid is visiting holy and religious places in very open clothes. 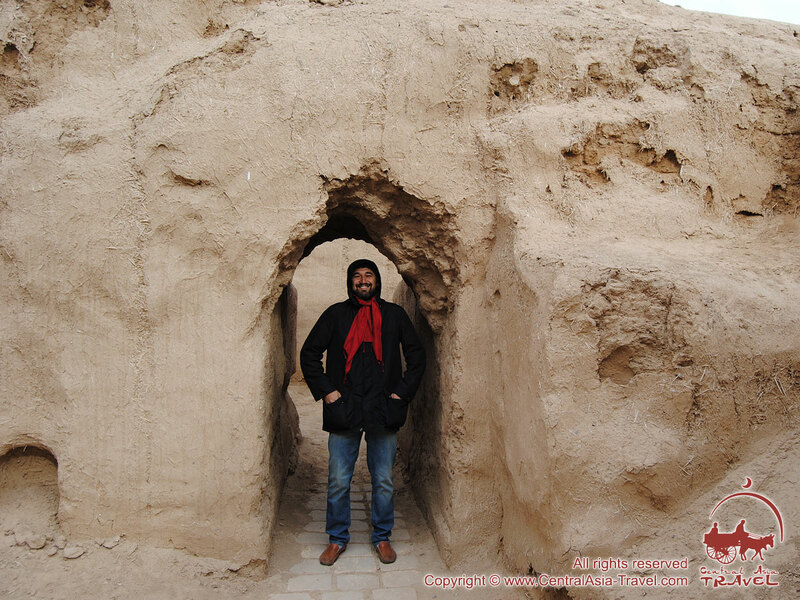 The hot climate of the country requires that you wear light clothes made of cotton and other natural fabrics. When in the countryside, you should not use open T-shirts, as there is the risk of getting sunburnt. Headdresses should also be included in your set of clothes. In town you can freely use light sandals or similar footwear, while in the country, and particularly in desert areas, you should wear trainers, as the region abounds in poisonous insects. First courses are more common in Turkmenistan than second ones. 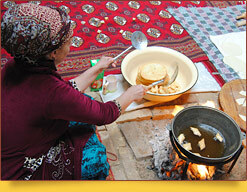 You will not find anywhere in Central Asia such a variety of soups as you will in Turkmenistan. They include the flour soup umpach-zashi, the pea soup gaynatma, the tomato soup gara-chorba and many other variants. All these different types of soup have one common feature: mutton broth chorba is used as their base. This is the same broth which is popular among Kazakhs, who drink it, and Uzbeks, who add vegetables and cook their traditional soup shurpa. Turkmen soups are often more nourishing than those cooked in the neighbouring states, while the small amount of spices added will allow you to feel perfectly the meat and other ingredients. A European often cannot eat a second curse after he has had such soup. Nevertheless, you should not be too quick and refuse from the second course, as their variety and greatness in Turkmenistan will hardly leave you dispassionate. For instance, govurlan-et - fried mutton with tomatoes where the balance between the vegetables and meat is so perfect that the former make the latter taste a little sour, while the latter endows the former with sweet and spicy flavour and impregnates it with fat. The Turkmen pilaf (also spelled pilaff, plov, pilau, pilav, polow, pulaw, pulao) is also worth paying attention to, even if you have become quite tired of this dish in the course of your tour in other Central Asian countries. Turkmen have an absolutely different way of cooking pilaf. Alongside rice, meat, onion and carrot, very often you can find in it dry and fresh fruit of various kinds, which accentuate the taste of other components and make the whole dish a shade fresher and more piquant. And only in Turkmenistan you can taste the most unusual pilaf with fish instead of meat. It should be noted that Turkmen use marine food far more often than the other countries of the region, which can be explained with the presence of the Caspian Sea - a reliable supplier of such commodities to local markets. That is why fish dishes, such as balyk-gavurdak (fish baked in pots) and others, comprise a considerable portion in the Turkmen kitchen. 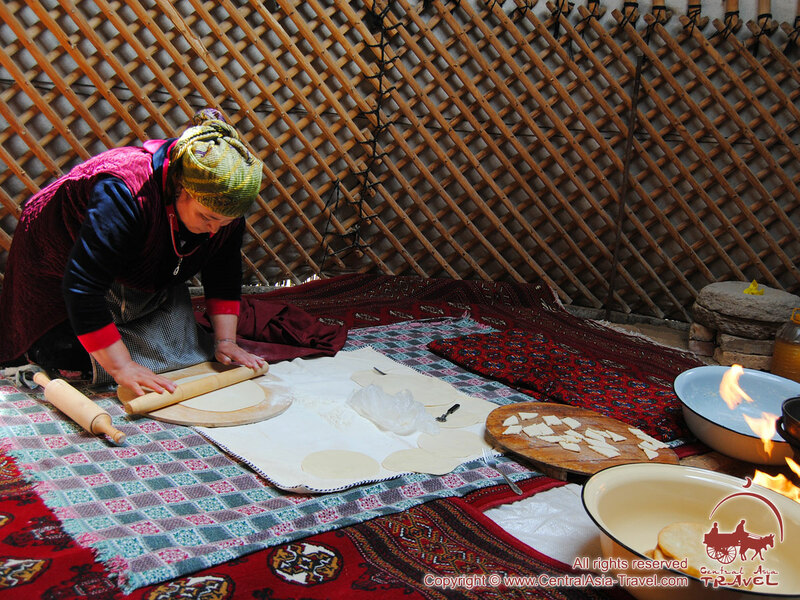 Milk food in Turkmenistan is also quite diverse and often tastes rather unusually. It is interesting that there are many types of it, such as chala, teleme, agarana and others, which are made of camel milk. 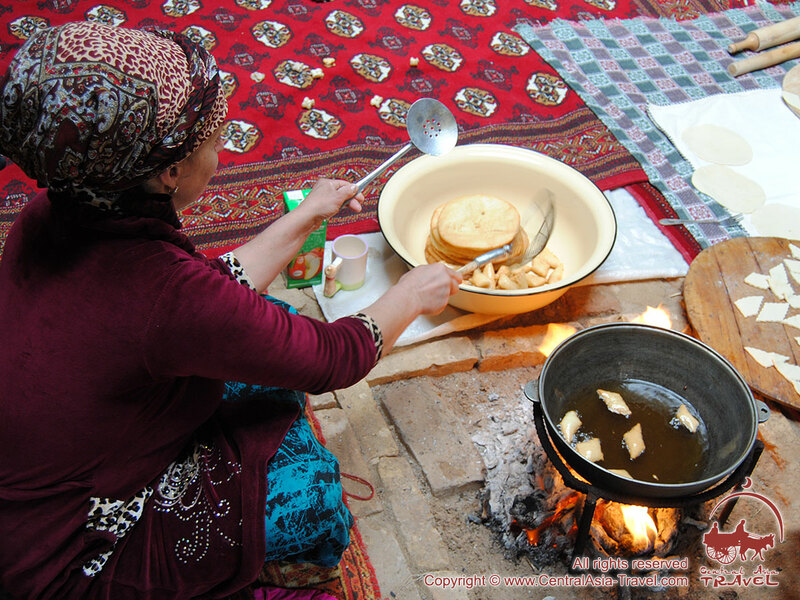 Turkmen baked food is very popular in the region and is also one of the elements of the local cuisine distinguishing the country from the other ones. Biscuits pishme and pasties shilekli will appeal to all who like the oriental kitchen, as well as to those who are fond of the European cuisine. We recommend that you drink only bottled or boiled water, using it also for washing fruit and vegetables and cleaning your teeth. Cost of Food in Turkmenistan. The guests of the country will also be happy with prices for local meals in restaurants and cafes. A good dinner in an Ashgabat café would cost you between $10 and $15, while in smaller cities and towns it may be even less, about $8. Despite being very interesting for tourists, Turkmenistan has a rather complex visa system, inconvenient for most of the foreigners. 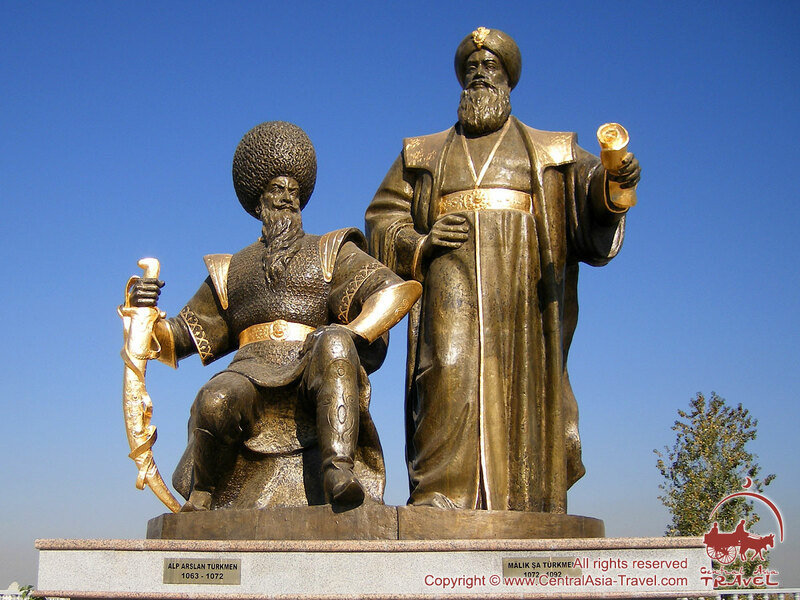 To visit Turkmenistan people from any country of the world must have a visa (details here). A visa to Turkmenistan may be obtained on the basis of invitations issued by the State Migration Service of Turkmenistan. There are two ways of getting the visa to Turkmenistan: right at the Ashgabat airport (in this case visitors must pay consular fees for the promptness, and, besides, there is always a chance you would be denied the visa and deported to your home country at your own expense) or beforehand at the consular department of the Embassy of Turkmenistan. Registration. Foreigners who have arrived in Turkmenistan for a period of over three working days must register in the State Migration Service of Turkmenistan within three working days. They also may register at the hotel they are staying, in which case the hotel employees must provide them with all necessary documents. You should keep all these documents to the end of the tour, or you may have problems when leaving the country. You are allowed to stay at any place without registration for a period within three days. 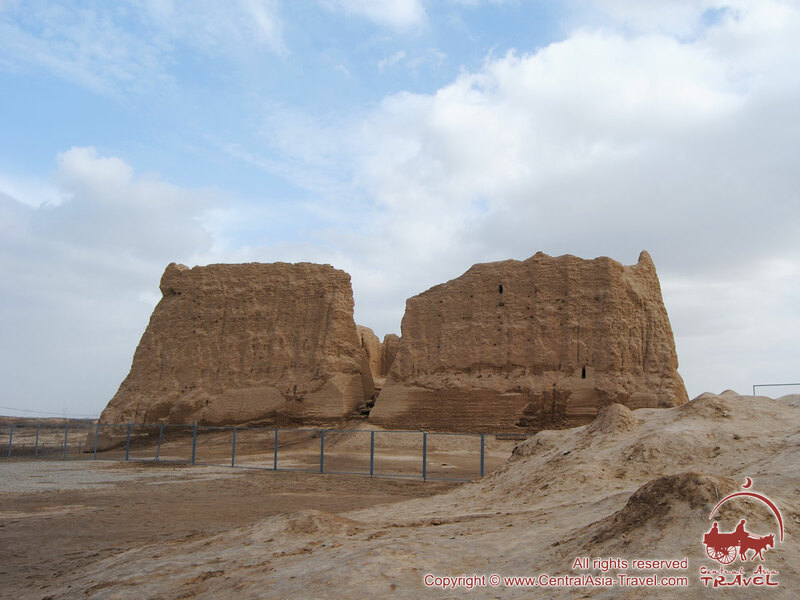 In general, guests from other countries can feel absolutely safe in the territory of Turkmenistan. The effective work of the police keeps the criminality at the lowest level in Central Asia. Certainly, there is always a chance that you will become a victim of a pickpocket, but it is no bigger than, for instance, in any European country. You should simply not take large sums of money or precious things with you when you leave the hotel. To visit areas lying next to the border you will have to obtain a special permission. As in most of the countries of the world, bringing pornographic materials, drugs, weapons, ammunition and printed matter that may bear any threat to Turkmenistan’s constitutional system is prohibited. Foreigners may not bring the local currency to the country or take it out of it. The currencies of other countries may be brought to the country in any quantities; however, when leaving the country you must have a smaller amount. On the arrival in Turkmenistan you will be asked to fill a customs declaration, where you should give all necessary particulars. You should retain the customs declaration to the moment you will leave the country. If you purchased any items in the territory of Turkmenistan, you should obtain a certificate confirming that the item is not valuable from the historical aspect. Large souvenir shops provide their goods with such certificates; therefore, buying souvenirs in such places will save your time and nerves. Taking fish and sturgeon caviar out of the country is strictly forbidden. 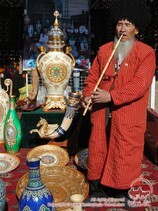 The following items may not be taken out of Turkmenistan either: jewellery having no hallmarks, precious and semi-precious stones and half finished articles made of them; apitoxin (bee venom), snake venom, amberat and propolis; meat of any kind and food made of it; plants and animals included in the Red Book of Turkmenistan; carpets without certificates from the Turkmen Khaly State Union. We recommend that you retain all the receipts after you pay for your purchases. 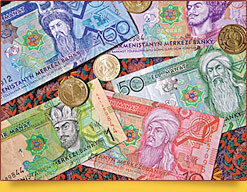 To make payments using any foreign currency is prohibited in Turkmenistan. You can exchange a foreign currency in banks or official exchange offices. Banks usually close at 17.00, while exchange offices at hotels and airports work 24 hours a day. They usually accept only US dollars of the new type. Banknotes must not have any defects; otherwise the employees of a bank or an exchange office may refuse to exchange them. We strongly recommend that you should avoid dealing with moneychangers at bazaars or in the streets, as there is the risk of you being swindled or arrested by the police for illegal currency operations. Bank cards issued outside Turkmenistan are almost invalid in the territory of the country. You can use them only in large hotels or trade centres in the capital. 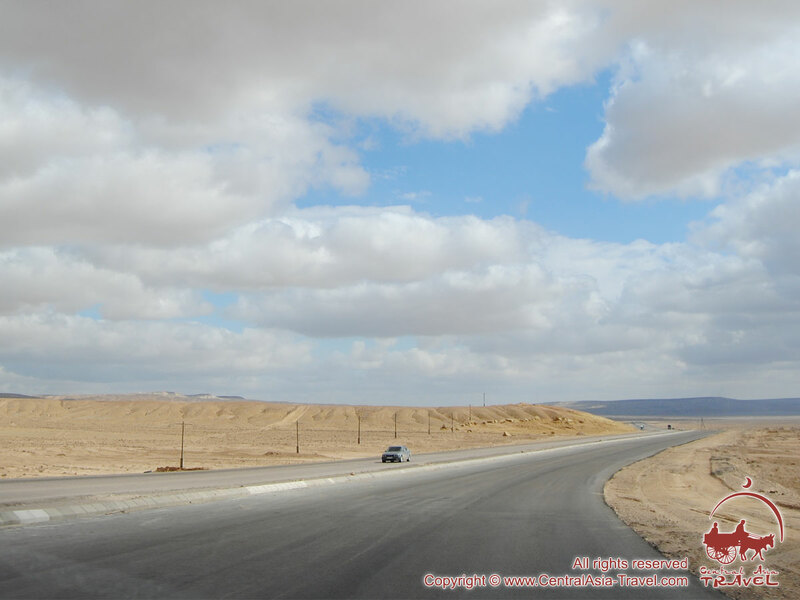 Internet in Turkmenistan is limited (some websites have no access), the quality of the connection is not very good, the traffic speed is low, while the prices are rather high. In the recent years the situation with the internet connection in Turkmenistan has become better, but the high-quality Wi-Fi still remains a dream. 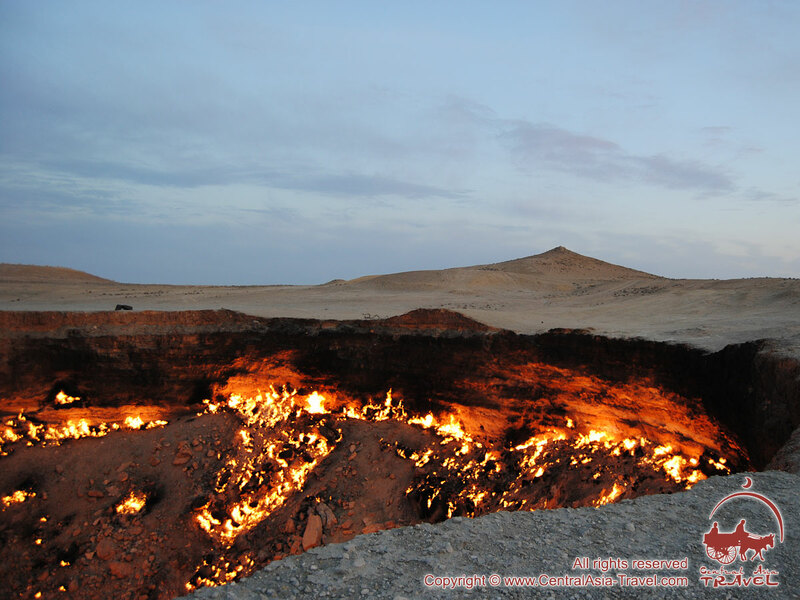 In Turkmenistan you can photograph everything except military installations and some governmental buildings. Nor we recommend photographing and filming at airports and border areas. 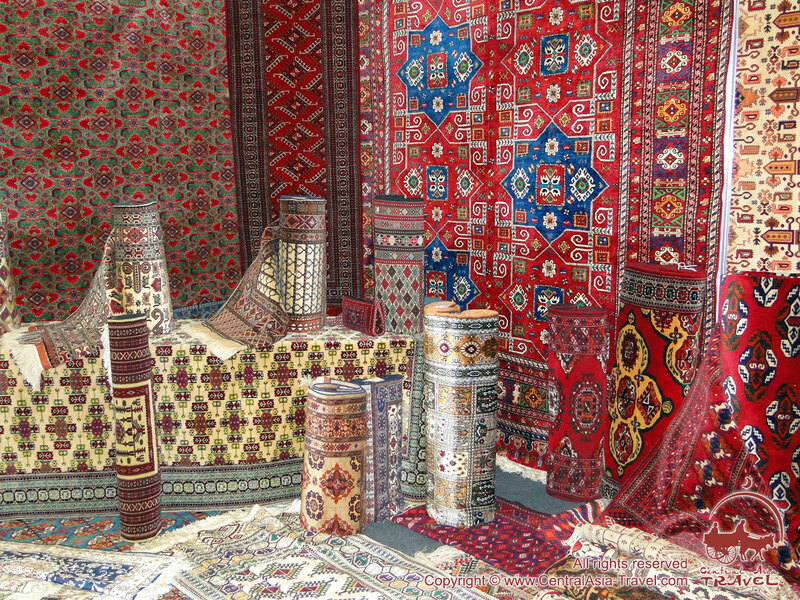 Carpets are, doubtlessly, the most popular Turkmen items around the world. Mistresses make them only by hand, using tools and looms that have not changed for hundreds of years. The finesse of the ornaments on Turkmen carpets is impressive! 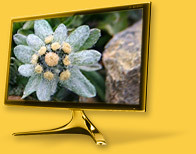 Looking at them you will see a three-dimension image. The only weak point of a souvenir of this kind is its price. 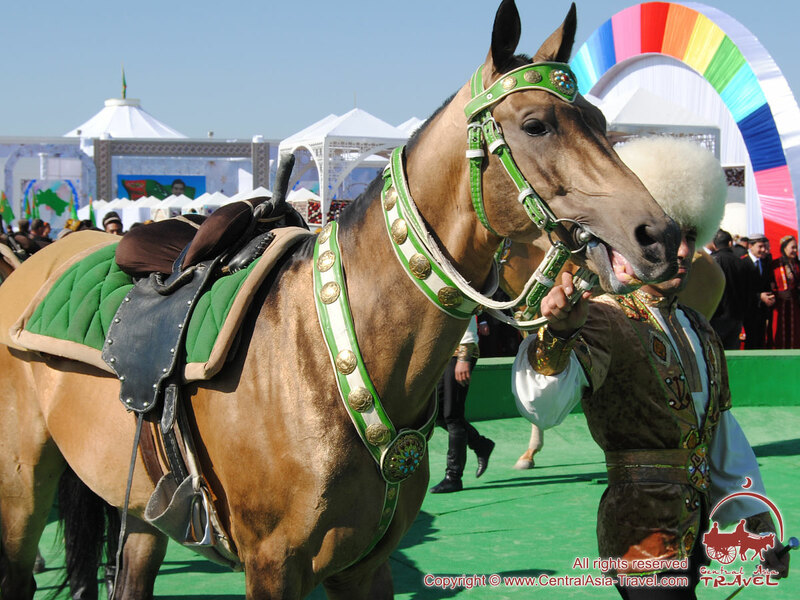 The Turkmen know the worth of their horses as well. So, you cannot take an Akhal-Teke horse out of the country however much you pay. However, in shops you can find a great number of statuettes representing this horse and horses of other types. Made of wood or clay, one of them will surely adorn your desktop. 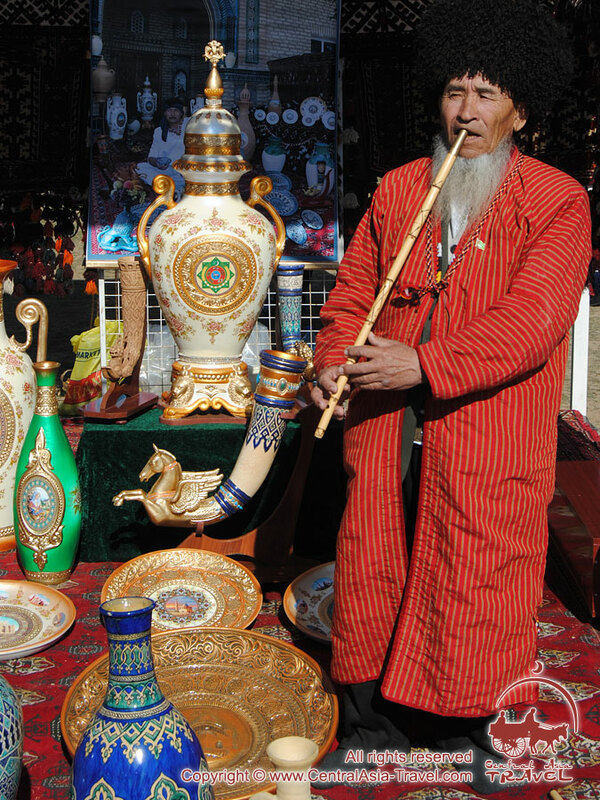 You can also find a variety of ceramic whistles in Turkmenistan. The sounds produced with these whistles will remind you of a flowing brook, a wind blowing in a desert or surf. Such souvenir from a faraway country will be a good present not only for a child, but for an adult, too. If one wants to protect a friend from the evil eye, artisans from Turkmenistan are ready to help and offer a wide range of carnelian amulets. Adornments made of this mineral are believed to protect from evil spirits and to make their owner happy. 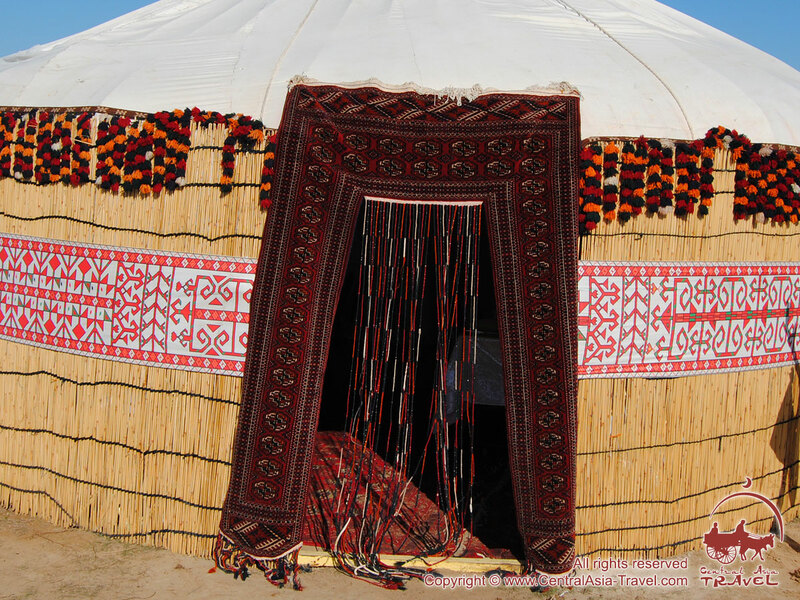 Those who do not believe in either evil or good spirits can bring home some warmth of hot Turkmenistan placed in a telpak, a national headdress from white fur of a sheep. National peculiarities, norms of behaviour and local customs. 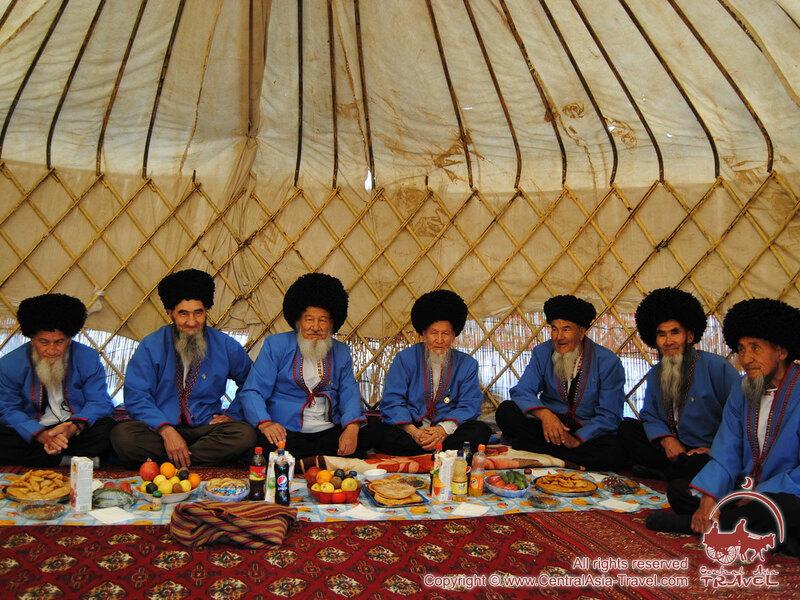 In everyday life Turkmen are good-natured, hospitable, calm and composed people. 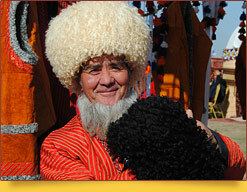 Their local customs are based on the ancient Turkic culture and Islam. 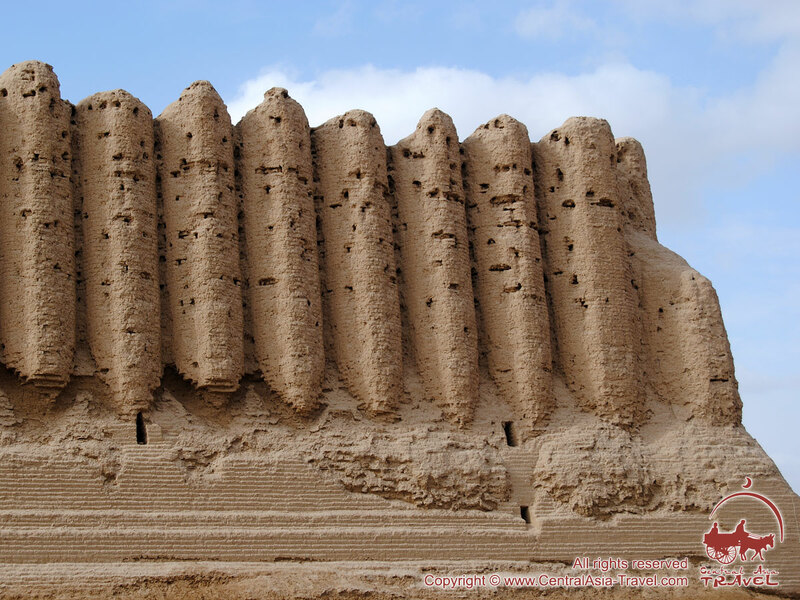 Iran and the Russian Empire had a great influence on the region in different periods of history. Apart from official laws, certain long-established traditions and principles are used to solve some of the everyday problems. 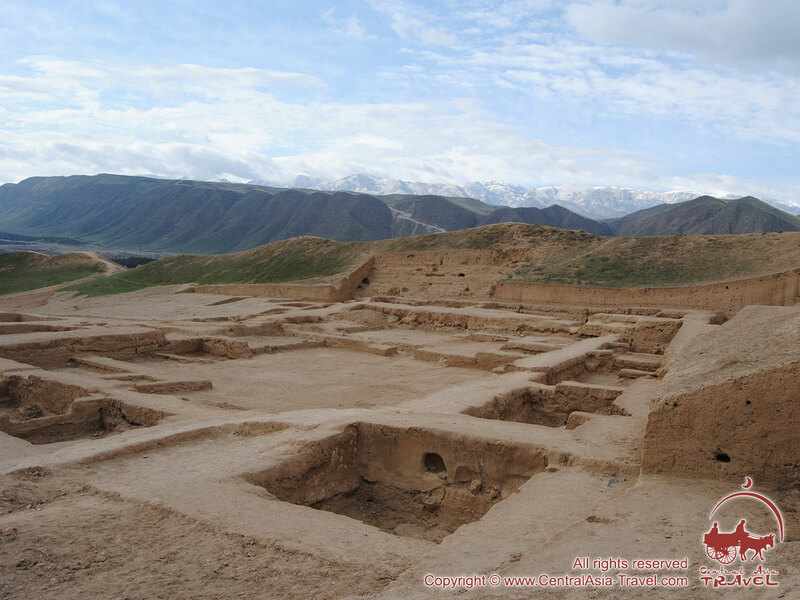 For instance, patriarchy and relations between tribes and families still play an important role in the Turkmen society; old people and particularly aksakals (elders) are highly esteemed in the country. We do not recommend that you talk about politics or discuss the former president of the country. If you want to phone somebody in Turkmenistan from outside the country, you will have to dial the international exit code of the country you are in, add 993, Turkmenistan area code / mobile network operator code and subscriber’s number.